Only 266 pieces in stock! A power punch for both pesky breakouts and preventing premature aging. Sea buckthorn and sugar extract in this nutrient-rich facial oil sinks into skin to deliver high levels of antioxidants, rare fatty acids, and gentle exfoliation to heal, soothe, hydrate and clarify your complexion. Prickly pear seed oil, sea buckthorn berry oil, and pomegranate oil give skin a trifecta of antioxidant protection, vitamins, and fatty acids to heal, brighten, and rejuvenate the skin. Tamanu and tea tree oils fight blemish-causing bacteria. Sugar extract, a natural source of glycolic acid, very gently exfoliates to decongest pores and make skin more vibrant. Blue chamomile and immortelle essential oils, calm inflammation and also speed up healing of blemishes. There’s also CoQ10 which ramps up collagen production to increase skin elasticity. Prickly Pear Seed Oil // Also known as barberry fig oil, this luxurious and nutrient-dense super oil is a powerhouse. It has a higher Vitamin E content than any other oil on the market, making it a potent antioxidant. There is also Vitamin K, known to brighten the skin, belatains (a super-antioxidant), and essential fatty acids such as linoleic acid (omega-6). Prickly pear oil is easily absorbed into the skin, protects against free radicals, refines uneven texture, helps prevent premature aging, provides nutrients, and brightens a complexion. Sea Buckthorn Oil // This cold pressed oil has a deep amber color because of its rich content of the antioxidant beta-carotene. It is also loaded with skin-loving, free radical fighting compounds such as vitamins A, C, E, fatty acids like Omega 3, 6, 9, the very rare Omega 7, phytosterols, and flavonoids. Some research has shown that sea buckthorn can help reduce sebum production, reduce the occurrence of breakouts, and speed up healing. CoQ10 // A naturally occurring substance present and abundant in human cells. CoQ10 increases collagen production, protects skin from UV damage and inflammation. When applied topically it works as a barrier to keep free radicals at bay and enhances the skin's ability to regenerate itself. Sugar Extract // Sugar is a natural source of glycolic acid, a superior exfoliant that helps slough away dead skin cells to help reveal a brighter, more youthful complexion. Blue Chamomile essential oil // Also known as German chamomile, this blue essential oil is one of the most powerful healing oils for acne. Close in kin to blue tansy, or Moroccan chamomile, this version is high in flavonoids, terpenoids, oxides, and azulenes (chamazulene is what gives the essential oil its beautiful blue color). It has antioxidant, antimicrobial and antibacterial properties to help get rid of bad bacteria, it’s an anti-inflammatory and has powerful skin healing effects that work wonders on problematic skin. Immortelle essential oil // Helichrysum, also known as immortelle or everlasting, is a small yellow flower with amazing healing and regenerative properties. It gets its name from the fact that the blooms never wilt! The essential oil extracted from it is a powerful healer and has cell regenerative properties. Used in synergy with blue chamomile, it creates a powerhouse skin healing combo, great for diminishing redness and speeding the healing of blemishes. This is a wonderful anti-aging and healing ingredient. Tamanu oil // Pressed from the nut of the Ati tree, this exotic oil has skin-healing and regenerative properties. It’s also an antibacterial, is loaded with antioxidant and anti-inflammatories, which makes it especially useful as an essential oil for acne and treating other skin irritations. Pomegranate oil // Useful for cell regeneration, anti-aging, and deep moisture. Pomegranate oil is high in flavonoids, antioxidants, and ellagic acid, which helps prevent UV damage. There’s also punicic acid (omega-5) which can calm and soothe inflammation and prevent moisture loss. Massage a few drops of this nutrient-packed clarifying oil into the skin after cleansing and toning. If you prefer a lighter application, mix it in your palms with one of our toners to create an emulsion. This serum works as both a serum and moisturizer, so there is no need to follow with a moisturizer. Note: Sea buckthorn oil is a magical oil, but it’s deep orange hue can stain fabrics (not skin!). We recommend letting this serum sink in for at least 15 minutes before going to bed or face planting on a pillow. I've never used serum before in my life - have always been a cream moisturizer girl. Well, I'm not going back. I was hesitant at first, wondering how a serum could possibly replace a moisturizer. Well, it does! This product leaves my face feeling sooooo smooth. This serum - with the combination of soap and toner - has been a life-changer. Seriously, LIFE CHANGING. I have struggled with acne my entire life - I have tried every OTC product AND prescription medication (I failed Accutane three times....for those of you who know what Accutane is, that's something!). 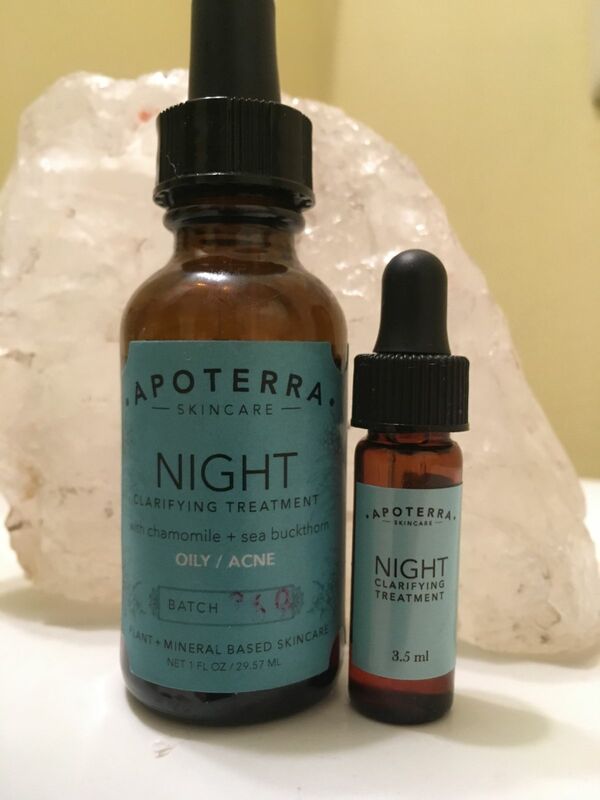 The combination of Apoterra's products has helped my acne significantly for the first time in my life. I have had no major breakouts and my skin looks and feels healthier and it's natural! I am a true believer in these products and in the serum. *Only downfall: the scent (at least that's what my husband says...it doesn't really bother me but it is strong and "earthy") and it has stained my pillowcase due to the ingredients (small price to pay for better skin!). Love this product! It does seem to help for my skin a bit and feels great! Has a strong natural smell but I don't mind it. I had been using True Botanicals Clear oil for the last few months but wanted to switch to something cheaper (man, does that stuff break the bank...). Apoterra’s clarifying treatment is less than half the cost, and seems to be a better fit for my skin! I love the scent of this line, too. I usually mix about three drops with two of rosehip oil every night before bed, and it feels really nice and moisturizing. I’m giving it four stars because while I like it, I haven’t noticed any major changes in clearing up my acne or scars. The scent of this took a few days for me to get used to; I wasn’t used to my beauty products smelling so NATURAL. Ha! Now I realize the scent reminds me of a sage plant that grows near my home and it’s soothing. I spray the Neroli toner on in the morning and wipe with a cotton pad, then follow with this night oil; at night I wash with the pumpkin soap bar, spray the toner and follow with the night oil. One GREAT thing that has come about: my face used to have extremely dry spots and now they’re completely gone!!! That’s a win in my book. I love how light it feels on my face. My face has had less breakouts since using this product.